Cleopatra Selene II (Greek: η Κλεοπàτρα Σεληνη) (25 December 40 BC - 6 AD), also known as Cleopatra VIII of Egypt was a Ptolemaic Princess and was an only daughter to Greek Ptolemaic Queen Cleopatra VII of Egypt and Roman Triumvir Mark Antony. She is the younger twin to Ptolemaic Prince Alexander Helios and was the namesake of her mother. According to Plutarch (Antony - clause 36), her second name in Ancient Greek means ‘Moon‘. She is of Greek and Roman Heritage. Cleopatra was born, raised and educated in Alexandria, Egypt. In late 34 BC, during the Donations of Alexandria, she was made ruler of Cyrenaica and Libya. Her parents, were defeated by Octavian (future Roman Emperor Caesar Augustus) during the naval battle at Actium, Greece in 31 BC. The next year, her parents committed suicide as Octavian and his army invaded Egypt. Cleopatra and her brothers became orphans. Octavian took the three orphans from Egypt to Italy. Octavian celebrated his military triumph in Rome, by parading the three orphans in heavy golden chains in the streets of Rome. The chains were so heavy, they couldn’t walk. The three siblings were taken by Octavian and given to Octavia Minor to be raised in her house in Rome. Octavia Minor became their guardian, despite being Octavian’s second elder sister and their father’s former wife, whom he had set aside for their mother. Augustus between 26 BC - 20 BC, arranged for Cleopatra to marry African King Juba II of Numidia in Rome. The emperor as a wedding present gave her a huge dowry and appointed her Queen of Numidia. In return, she became an ally to Rome. 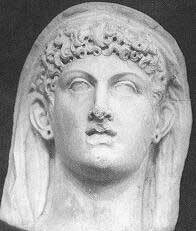 By then her brothers (Alexander Helios and Ptolemy Philadelphus (Cleopatra)), died probably through illness or murder. Juba and Cleopatra returned to Numidia and didn’t rule there for long. The local Numidians disapproved that Juba became too Romanized and this caused civil unrest. This forced the couple to leave Numidia and move to Mauretania. They renamed their new capital Iol to Caesaria (modern Cherchell, Algeria). Cleopatra is said to have exercised great influence on policies that Juba created. Through her influence, the Mauretanian Kingdom flourished, particularly with Mauretania exporting and trading well throughout the Mediterranean. The construction and sculptural projects (including the mausoleum where the couple are buried) at Caesaria and at another city Volubillis, were built and display a rich mixture of Ancient Egyptian, Greek and Roman architectural styles. Unfortunately, there is no specific surviving written sources on Cleopatra’s life. According to numismatic evidence and surviving monuments, suggest that Cleopatra inherited the iron will and perseverance of the Ptolemaic women. Cleopatra seemed to have been religious; patriotic of her Egyptian and Greek heritage; thus ignoring her Roman heritage and Cleopatra wanted to retain and continue the Ptolemaic Legacy. An epigram by Krinagorasis, is thought to be an eulogy of Cleopatra’s: The moon herself grew dark, rising at sunset, Covering her suffering in the night, Because she saw her beautiful namesake, Selene, Breathless, descending to Hades, With her she had had the beauty of her light in common, And mingled her own darkness with her death. Queen Zenobia of Palmyra is descended from her. Cleopatra is mentioned in the novels by Robert Graves, I Claudius and Claudius the God.